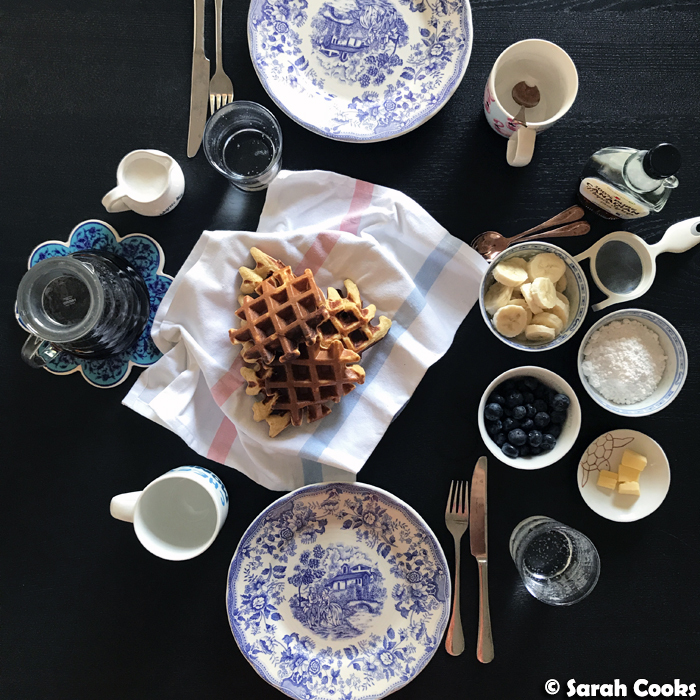 On Saturday, we had a lovely brunch at my friend April's house where she made corn fritters in her waffle iron and they were so good! It reminded me that it's not only waffles that can be waffled. The next day I had a craving for pancakes, but it was oppressively hot, and I didn't want to stand at the stove flipping and frying for ages. 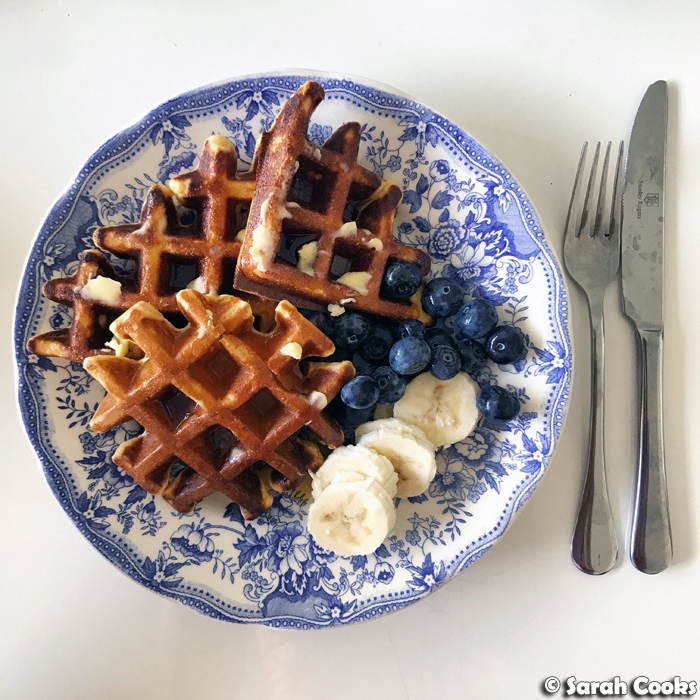 I had oats and cottage cheese on hand, and an idle flick through Pinterest for ideas on how to use these ingredients led me to these delicious-looking waffles on Kerry June's blog. She uses equal volumes of cottage cheese, oats and egg whites and blends them together before cooking. 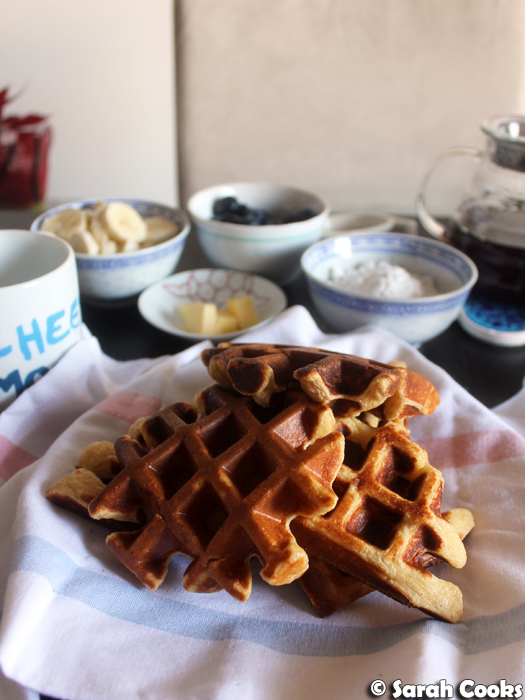 All the stars were aligning, I had to make waffles for our Sunday breakfast! I used my own recipe for cottage cheese and oat protein pancakes, just reducing the number of (whole) eggs in the batter so that it wouldn't be too runny and leak out the side of my waffle iron. I also added a little melted butter to the batter to help the waffles be removed more easily from the iron. (It's super hard to clean an electric waffle iron, so the less cleaning and scraping required the better). 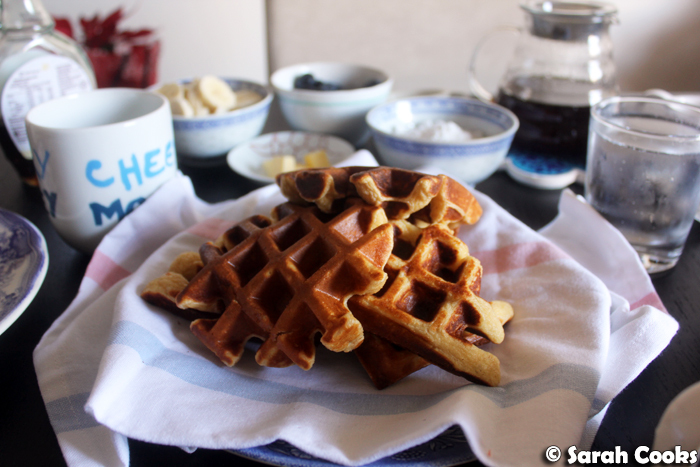 I wasn't quite sure how the batter would go in my waffle iron, but it worked so well! They were crunchy, light and fluffy and they looked and tasted great! All the deliciousness of the cottage cheese and oat protein pancakes, but faster! My waffle iron is pretty big, so I was able to cook all of the batter at once. Easy! 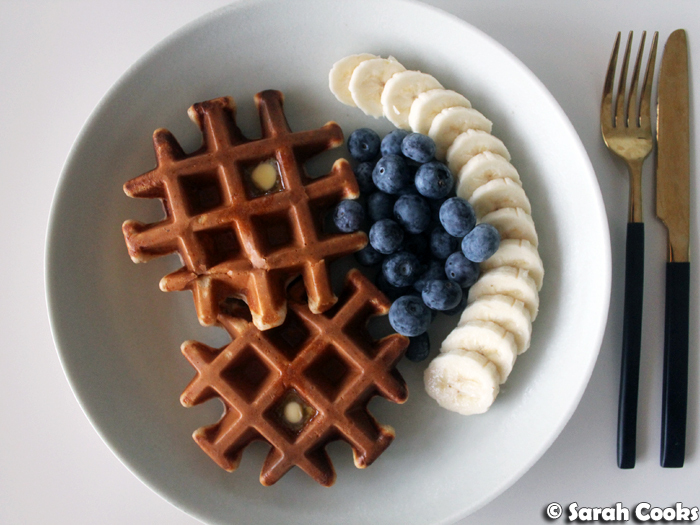 Not that you need any extra incentive, but as an added bonus, the waffles are a good source of protein! I did some calculations online and (depending on the brand of cottage cheese you use), you'd be looking at about 15 grams of protein per serving, which is pretty good going, especially for something that is such a treat and tastes so, well, un-proteiny. They'll fuel you up for the day ahead! The amount in the recipe below makes a nice serving for two people, but is easily scaled up or down depending on your appetite. Halve the amounts and it makes a single serving, which is totally doable on a weekday morning if you're feeling motivated. I know this because I was feeling motivated this morning and made my own single serve for breakfast before work! (I am often motivated by waffles). It only took slightly longer than making a smoothie, and was infinitely more delicious. Awww yeah. (Hot tip: don't bother making the batter the night before - as the mixture sits, the oats soak up the liquid and the batter thickens significantly, so it's best to make the batter just before you cook them). Let's get our waffle on! Place all ingredients in a blender and whizz to combine. Fill the waffle iron with the batter (I use approx. 1/2 cup of batter per waffle, but this will depend on the dimensions of your waffle iron), and cook until done to your liking. If you need to cook the batter in more than one batch, remove the cooked waffles and keep warm in a low oven (120C) on a rack (if you like them crispy), or wrapped up in a clean tea-towel (if you prefer them soft). Repeat until all the batter is used up. 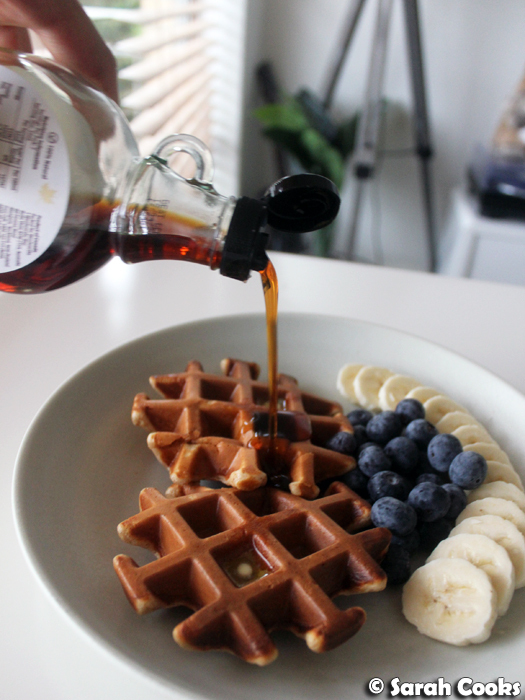 Serve with maple syrup, butter, fruit, anything you like! Well hello there! 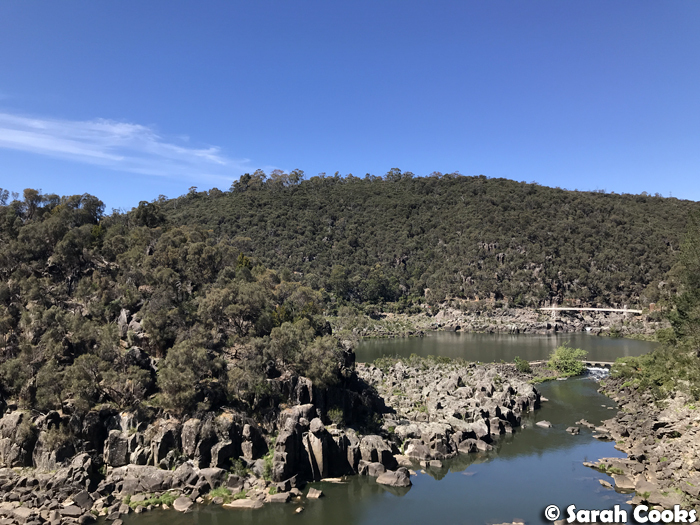 As I mentioned in my November Unblogged Files, I recently took a little weekend away to Launceston with two of my oldest friends, An and Adri. I'd been to Tasmania before (both Launceston and Hobart), but it was the first time for both of them. 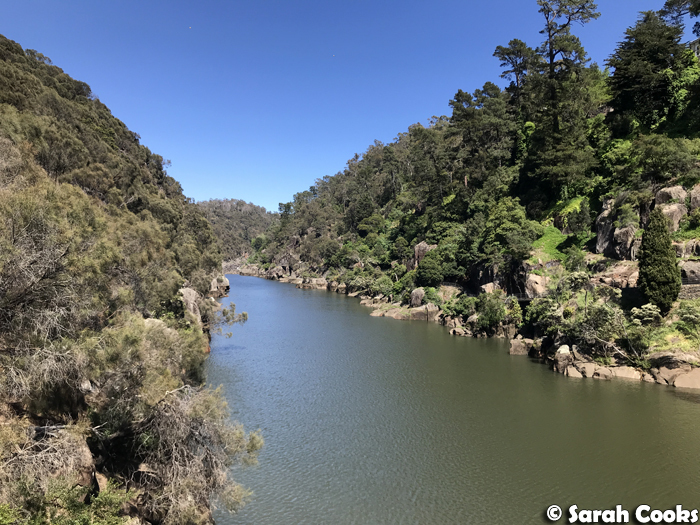 We wanted to have a weekend away, I suggested Tassie because it was close and easy, An picked Launceston on a whim, I put together a food-focussed itinerary, and Adri tagged along and was a generally awesome and easygoing travel buddy. Go team! 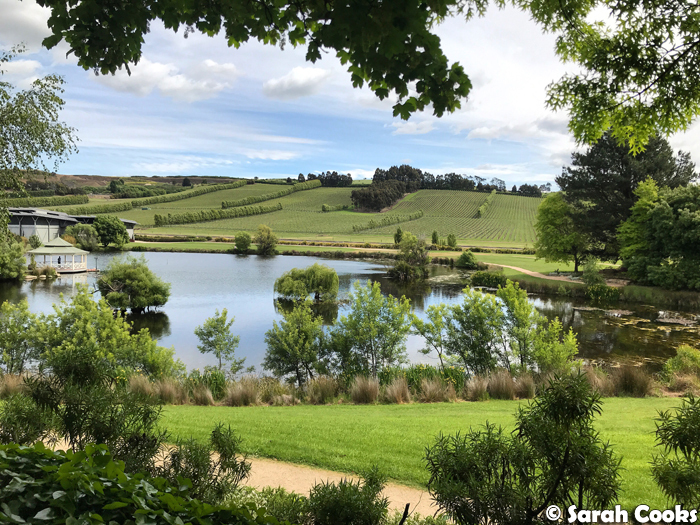 Here are some photos from our trip - a little nature, and lots of good food and wine! 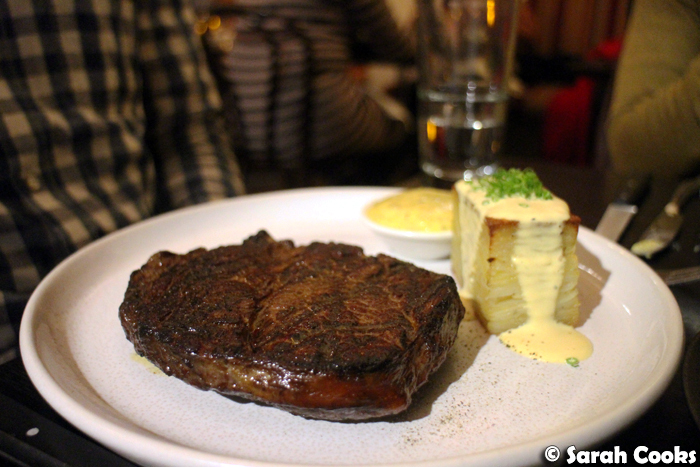 Dinner on the first night was at The Black Cow (70 George St, Launceston, TAS 7250), an excellent steak house. (You may remember The Black Cow from my previous trip to Launceston in 2010). I'm glad to say the food was as good as I remember! I would highly recommend having dinner here any time you're in Launceston. 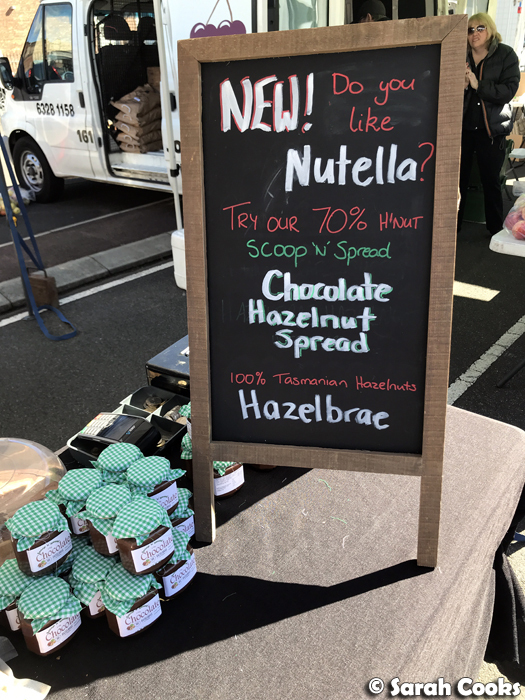 On Saturday, we started by visiting the Launceston Harvest Market (71 Cimitiere St, Launceston TAS 7250). There were lots of great stalls to see, we bought lots of goodies to take home, and we had delicious ham and cheese toasties from the Meat Bread Cheese stand. 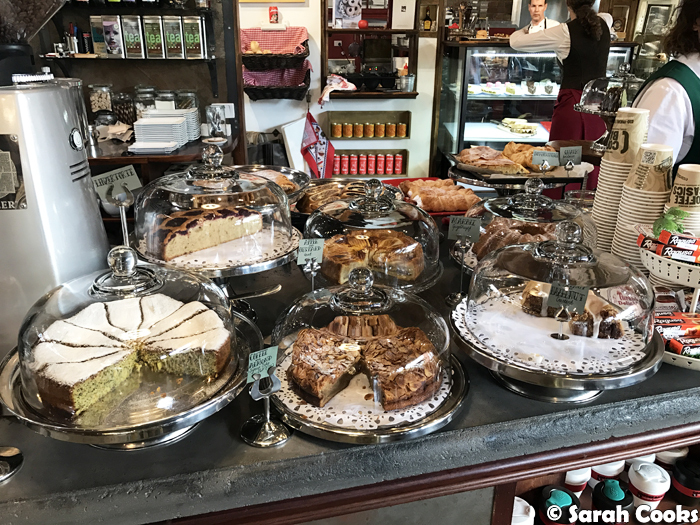 Our big destination for the day was Cradle Mountain, and on the way there we fuelled up with a second breakfast at Christmas Hills Raspberry Farm Cafe (9 Christmas Hills Road, Elizabeth Town, TAS 7304). It's an old fashioned, cheery, cafe with very friendly staff and lots of delicious raspberry goodies. 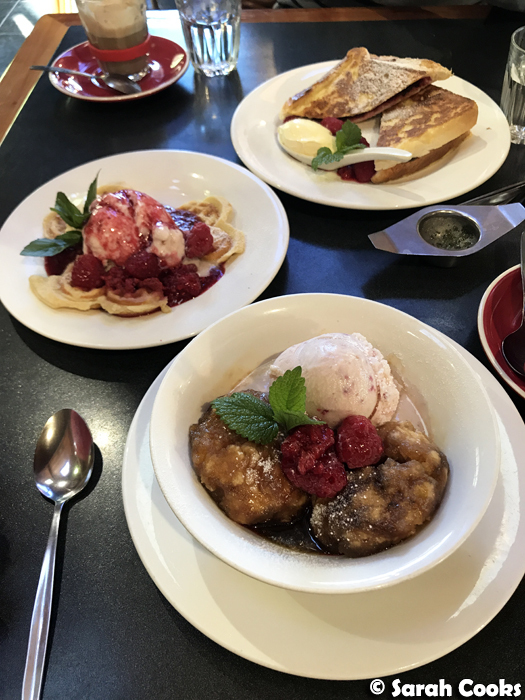 The chocolate-stuffed French toast, raspberry lattes and waffles were all good, but I especially enjoyed my order of the hearty caramel dumplings with raspberry ice-cream. (They reminded me of the old-timey golden syrup dumplings I learned how to make at school, from a battered copy of Cookery The Australian Way). 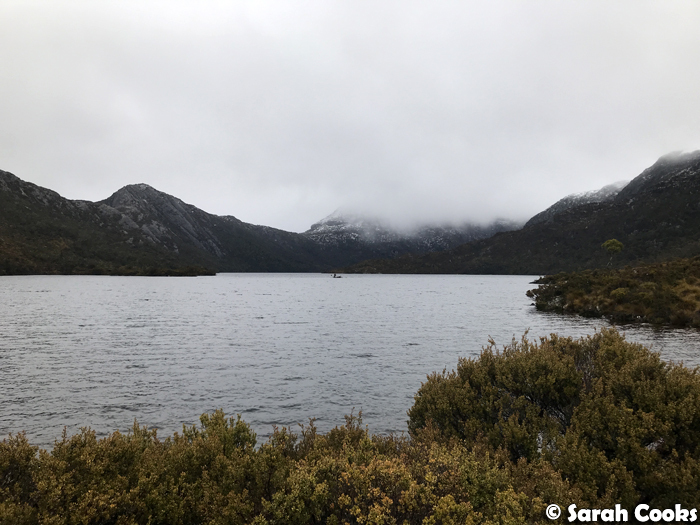 As we drove from Launceston, the weather got progressively worse and worse, and by the time we got to Cradle Mountain, it was bucketing down, windy, and freezing! I even had to buy a very snazzy Cradle Mountain fleecy jumper at the visitor centre on the way in. (And then I had to swiftly leave the visitor centre in case anyone thought I worked there and started asking me questions I couldn't answer, hah). An, Adri and I aren't particularly active people, so we certainly weren't planning on hiking (even the notion! ), but I had been hoping to do one of the easy walks like The Enchanted Walk. Oh well, the weather put a stop to that, so we just drove down to Dove Lake and had a wander around and took some photos. I love it there, it's so beautiful! 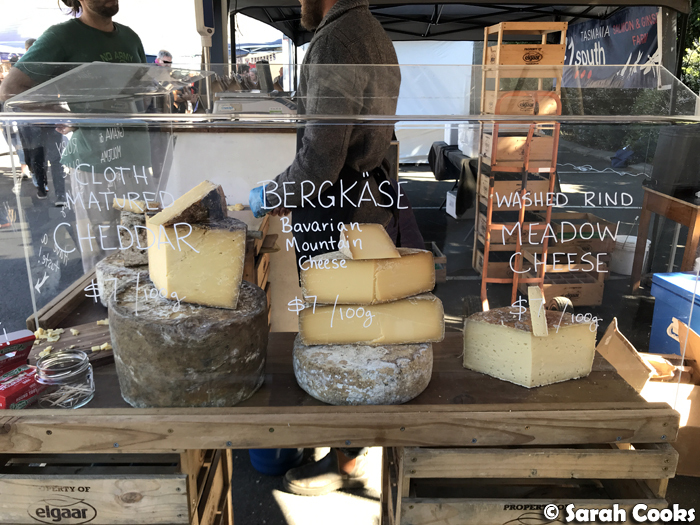 And of course the sky cleared up as we left Cradle Mountain, and it was lovely and sunny again by the time we got to Ashgrove Cheese (6173 Bass Hwy, Elizabeth Town TAS 7304) for an afternoon cheese platter. The shop there is pretty cool too, and I got some cute handmade jugs and cups to bring home (photo at the bottom of this post). 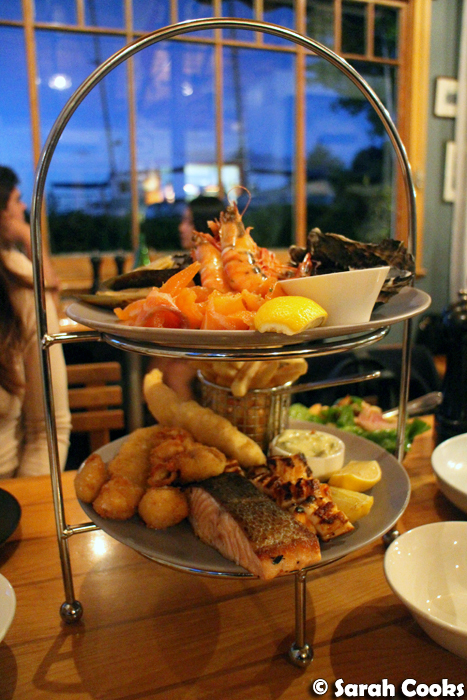 Dinner that night was at Hallam's Seafood (13 Park Street, Launceston, TAS, 7250). I hadn't been there before, but Adri chose it because she wanted some Tasmanian seafood and I was more than happy to go along! We shared an entrée and this very generous "hot and cold seafood platter for two", and a salad, and it was more than enough for the three of us. 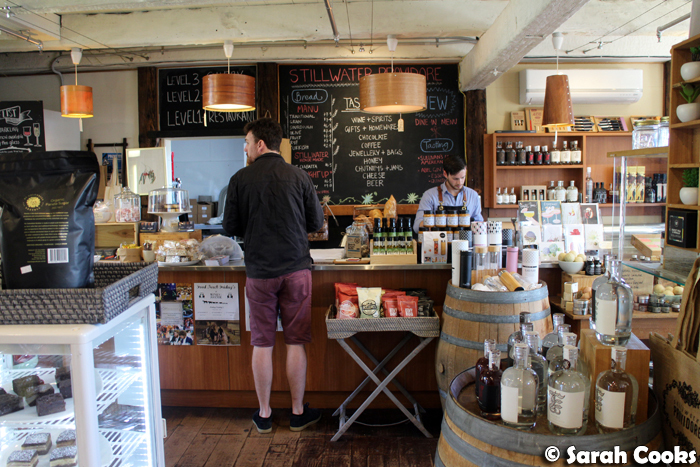 On our final morning in Launceston, we went to Stillwater (2 Bridge Rd, Launceston TAS 7250) for breakfast. 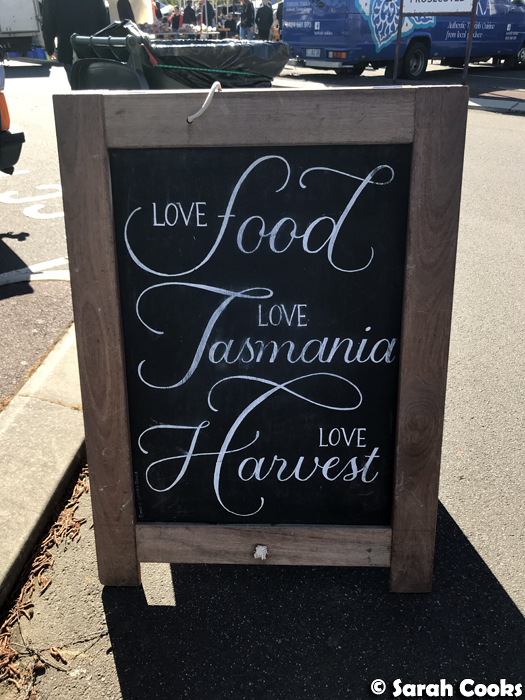 I really like this place, and I visited for both dinner and breakfast on my last trip to Launceston - you can read the posts here). I'm glad it was still as good as I remembered! An's chilli con carne with chorizo and crispy roast potatoes was a delicious behemoth of a breakfast, whilst I loved my rye waffles with cold smoked salmon, dill cucumber, poached eggs and mustard crème fraîche. Definitely a cut above usual brunch fare! (Although having said that, Adri's simple breakfast of poached eggs on toast with mushrooms was also very good). 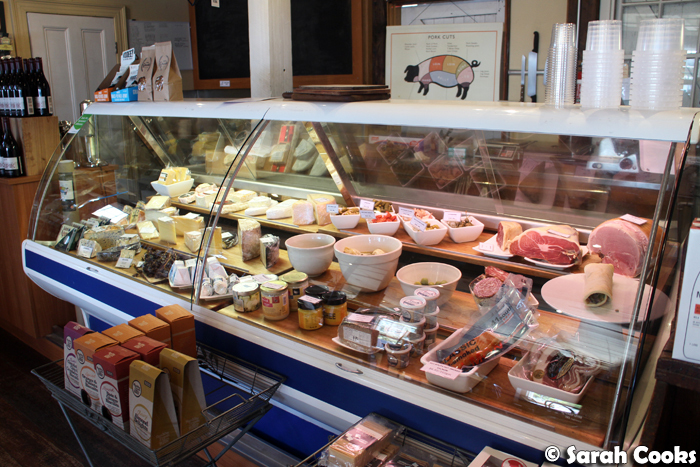 They've got a cute shop upstairs, Stillwater Providore, which sells a lot of homewares, pantry items, cheeses, alcohol, gifts, and more. It's well worth a look. 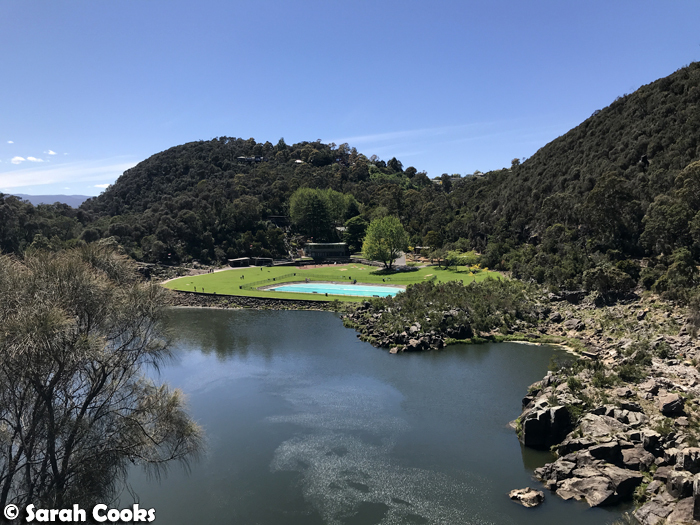 A very short walk from Stillwater is Cataract Gorge, a unique natural formation with a walking track, swimming pool, chairlift, suspension bridge, cafes and lookouts with gorgeous views. 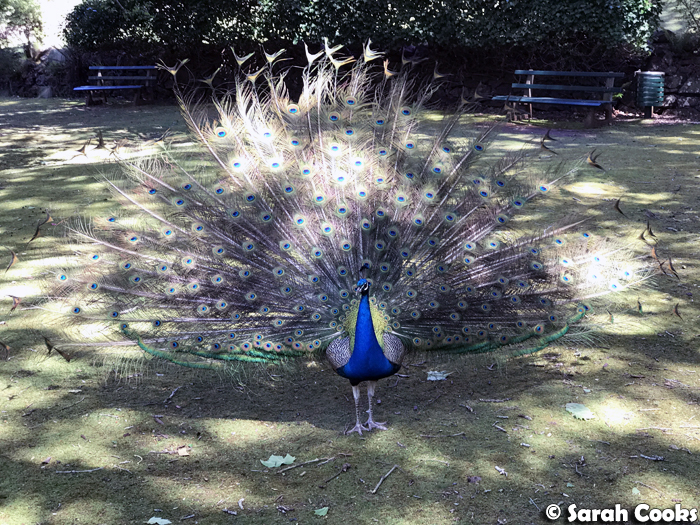 And they have peacocks! It's a really nice spot for a walk on a sunny day. 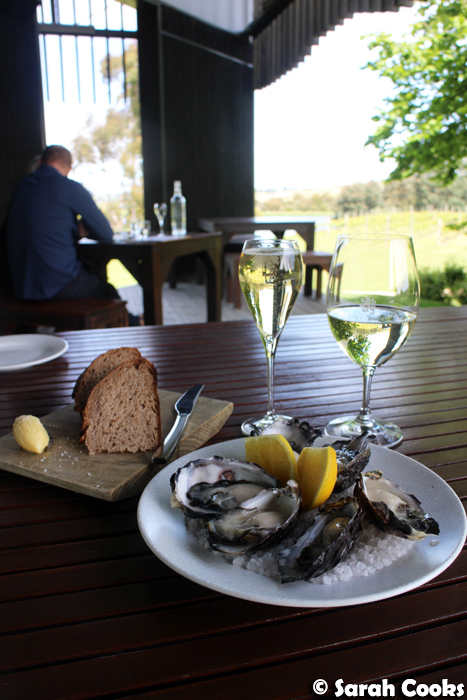 Last stop, before catching our flight back to Melbourne, was a lazy lunch at Josef Chromy Winery (370 Relbia Rd, Relbia TAS 7258). I'd never been before, but when I was planning our trip I thought it might be nice if we included a winery lunch, and some internet searches led to Josef Chromy Winery. I'm so glad we visited, because the food was excellent, the atmosphere was lovely, and we loved the wines! (We even ended up ordering a case of their SGR Delikat Riesling to have shipped home). They have a short, sharp menu that I believe changes with the seasons. We started with oysters and excellent house-baked spelt bread, followed by some hearty meat dishes, accompanied by double potatoes. 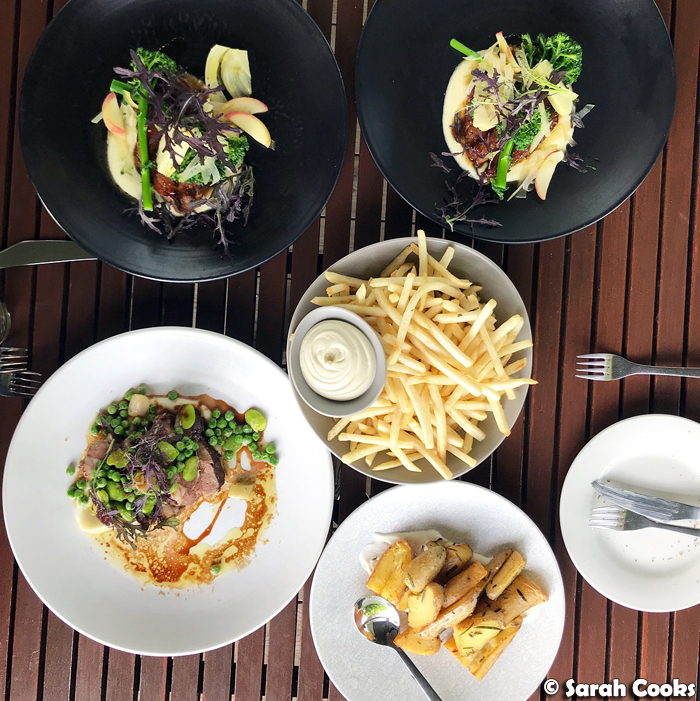 (Pork scotch fillet for An and Adri, tender lamb with peas and broad beans for me, roast kipflers and French fries for everyone). The only gripe I have about the meal is that the desserts were extremely small for the price. 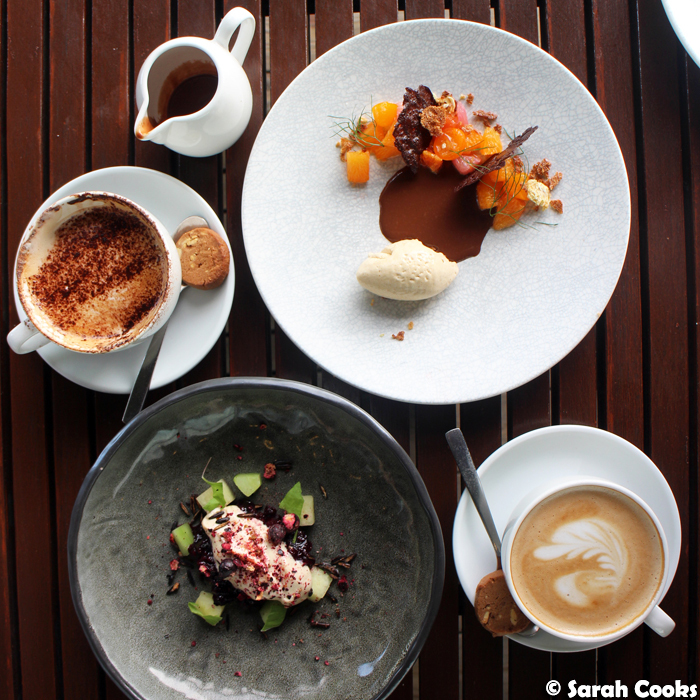 They were delicious and of high quality (the spelt toast ice-cream, in particular, was a standout), but at $16 I'd expect something a little bigger than a single small quenelle of ice-cream with a little jug of sauce, and the pile of fruits and crumbs. Aside from that, however, the meal was very good, and I'd definitely want to visit again. And finally, I want to show you all the goodies I purchased over the weekend - freeze dried blueberries (gonna make some super-stable blueberry cream! 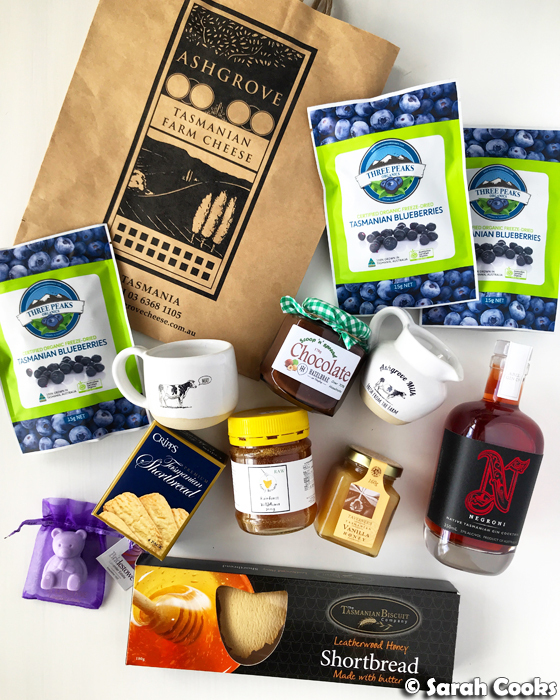 ), chocolate hazelnut spread, cute little coffee cup and milk jug, honeys, shortbreads, a bottle of Negroni mix, and a cute little lavender soap bear (that one was a gift from Adri). Yay! First Meal Prep Monday of the year! 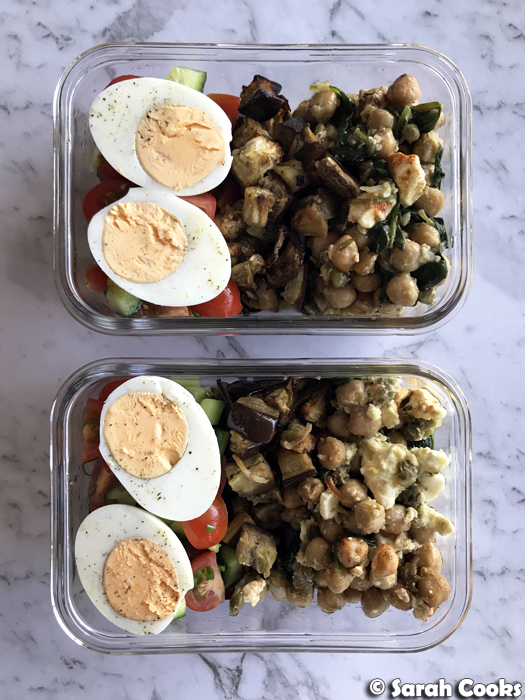 Today's Meal Prep is low key, but still healthy and totally delicious. 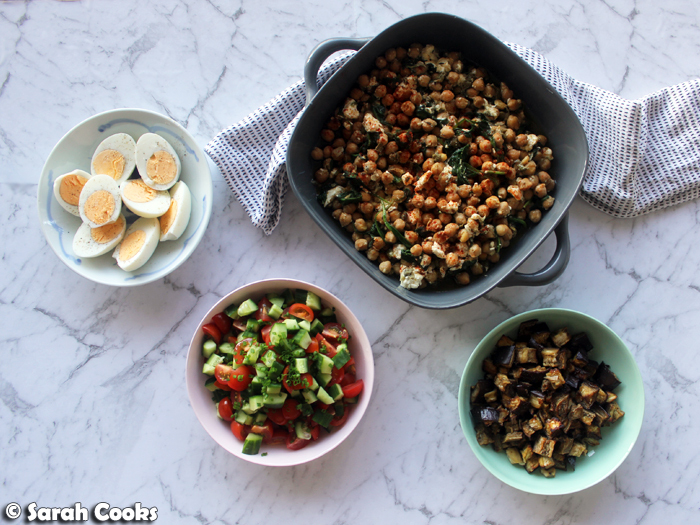 We've got olive oil braised chickpeas with feta, roast eggplant, hardboiled eggs, and a little cherry tomato and cucumber salad. The braised chickpeas come by way of the fabulous Joy The Baker. These popped up in my Facebook feed a little while ago, and went straight to the top of my to-do list! You sauté a little onion in lots of olive oil, then add chickpeas, thyme, capers, salt and pepper, cover the dish and cook it gently in the oven until bubbling hot and softened. Once cooled, you add some smoked paprika and crumbled feta. (I used the feta I made myself, *smug*). You can serve it with crusty bread as an appetiser or as part of a sharing meal, but it also is good left in the fridge to be picked at over a few days - perfect for meal prep. I also took Joy's suggestion of serving it with hardboiled eggs. 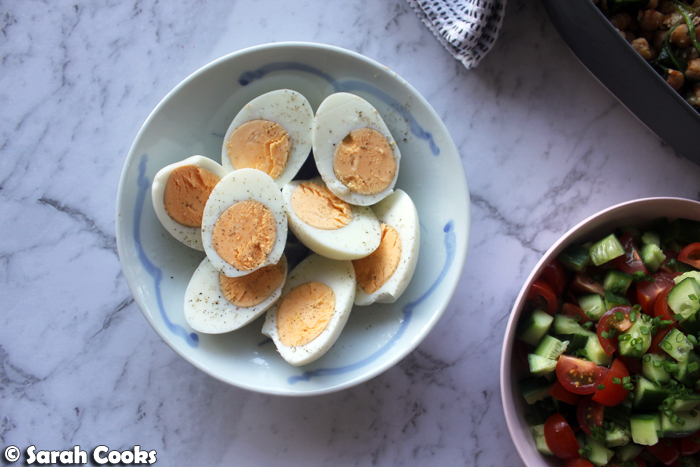 Delicious, easy, and protein-packed! 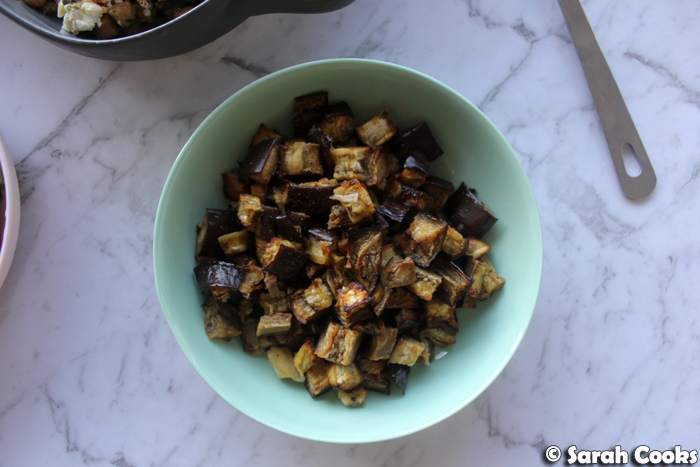 The roast cubed eggplant was so I'd have an extra vegetable, but I never really need an excuse to eat roast eggplant. I chopped these up and roasted them in olive oil on a separate shelf in the oven while the chickpeas were braising. Efficiency. 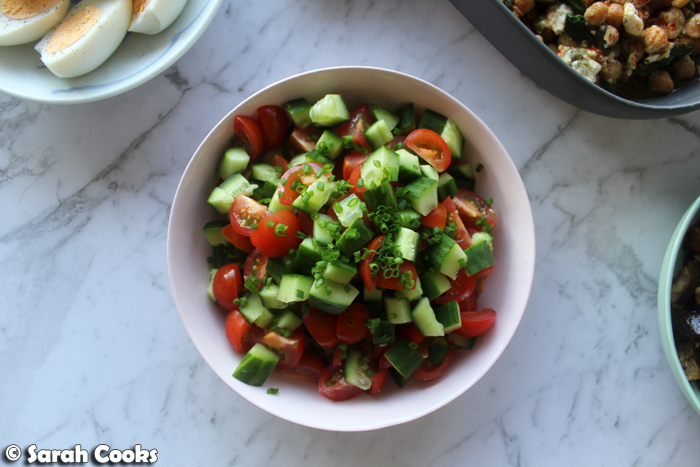 And I added a simple salad of cucumbers and sweet little cherry tomatoes, for freshness and contrasting crunch. I just dressed these with extra virgin olive oil, salt, pepper and a sprinkling of chives. I didn't use any acid (although red wine vinegar or lemon juice would be nice), because the chickpeas were already so boldly flavoured, and I just wanted to keep this one simple. And that was it! Super simple to put together, so many vegetables, lots of vegetarian protein, all in one easy to eat and delicious package. I'd definitely suggest setting aside a couple of hours on a Sunday to put this together - it's well worth it! Heat a splash of the olive oil in a pan that can go from stovetop to oven. Add the onions and cook over a medium heat until softened. 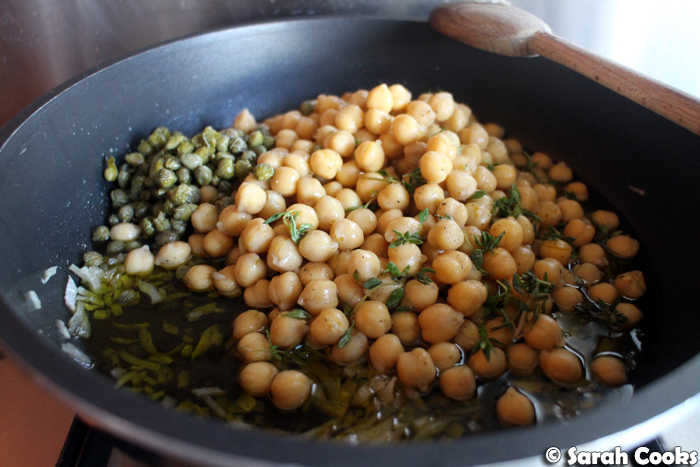 Remove from the heat and add the chickpeas, capers, and thyme. Season with salt and pepper and stir to combine. Cover the pan with foil and place in the oven. Remove from the oven, remove the foil and allow to cool slightly. Add the feta and sprinkle with smoked paprika. Chop 1 eggplant into 2-cm cubes. Place in a baking dish with 1/8 chopped onion and a generous drizzle of extra virgin olive oil. 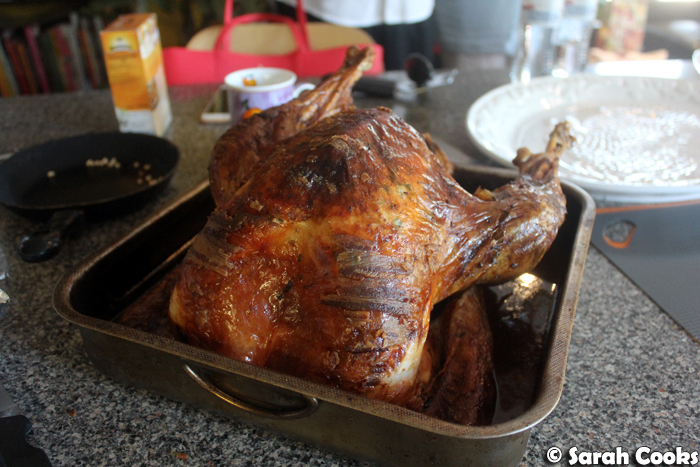 Roast in a 190C oven for 20 minutes, or until softened and golden brown. Season generously with salt and pepper. Place 4 eggs into a small saucepan of cold water. Bring to the boil, then turn off the heat and clamp on a lid. Allow to sit for 8 minutes. Drain and rinse under cold water. Once cool enough to handle, peel the eggs. Chop 1 cucumber into small cubes and place into a bowl. Chop 250 grams cherry tomatoes in half and add to the bowl. Drizzle with extra virgin olive oil, salt and pepper, and a sprinkling of chopped chives. Hello and happy New Year! 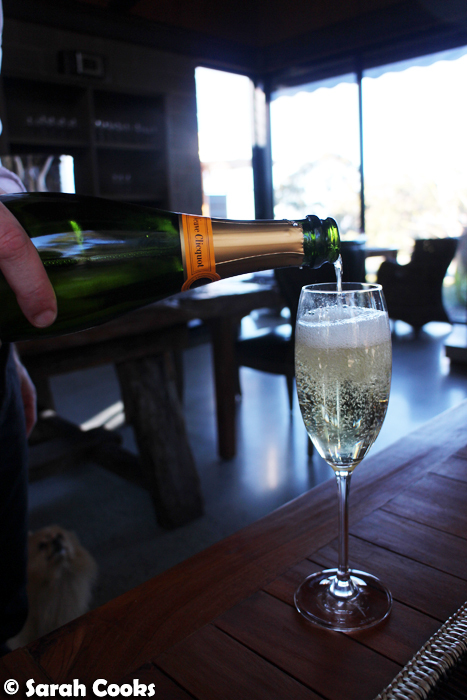 Well, there's no escaping it - we are well and truly into the new year now! The in-laws have flown back to Germany, my summer holidays are over, and I went back to work this week. The early morning starts have been a bit of a struggle, but other than that I'm well rested and ready to get back to my usual routine! 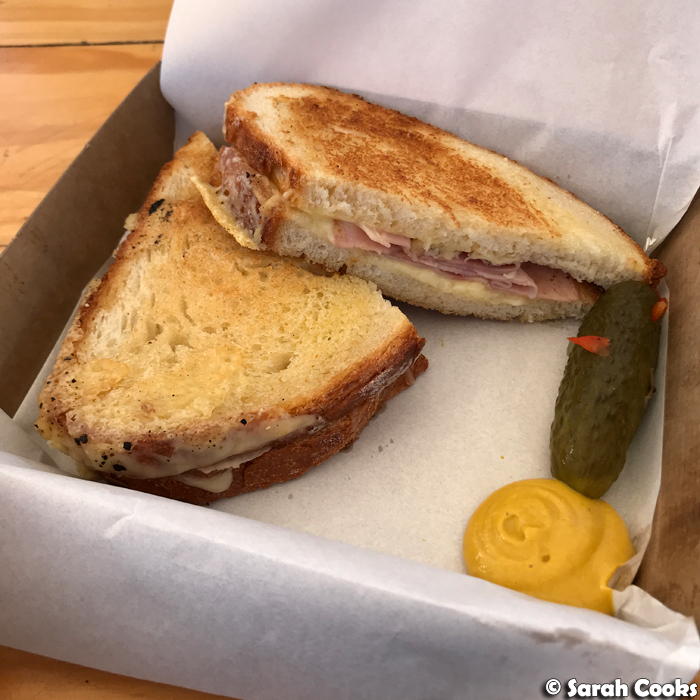 For one of my first posts of the year, I'd like to take a look back at 2017 in the world of Sarah Cooks! I did 71 posts in total, a slight increase from the previous year's 66 posts. Woop woop. 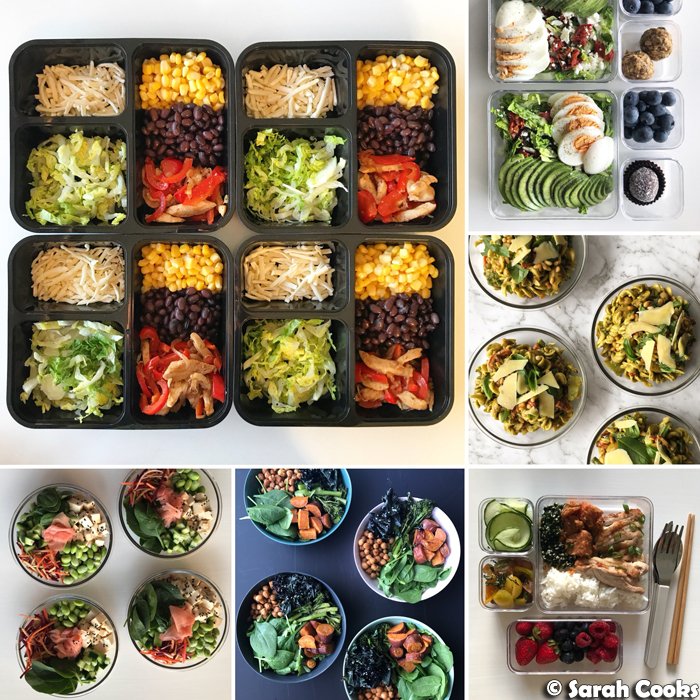 A lot of 2017's posts (20, in fact), were for my new segment: Meal Prep Monday, where I blog a new meal prep recipe for a week's worth of lunches. I've really enjoyed flexing my creative muscles and coming up with new healthy meals, and am looking forward to continuing the segment this year. 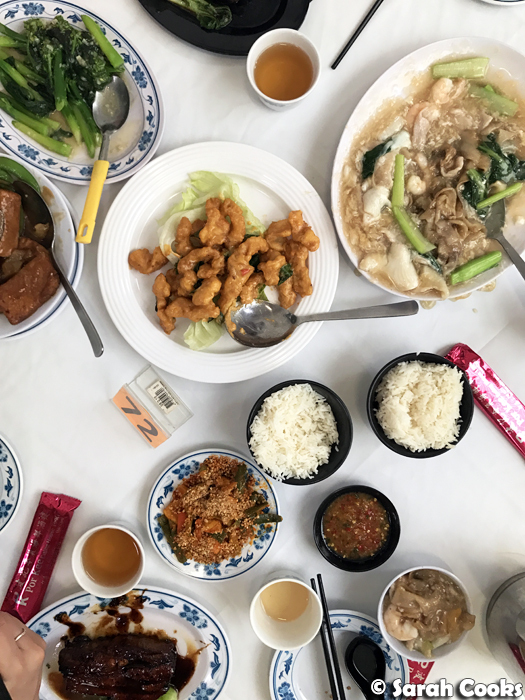 Speaking of segments, over 2017 I kept up my monthly Unblogged Files posts, rounding up the eating adventures of the previous month, and shocking myself, frankly, with how much I eat. However, as much as I've enjoyed doing these posts over the past six years, I feel now the time has come for that segment to end. When I first started these monthly round-ups in January 2012, I wasn't on Instagram (and it certainly wasn't the behemoth that it is today! ), and there was more pressure among the food blogging community to blog everything you ate or cooked. These days, I think Instagram is a better platform for publishing those short observations that I captured in my Unblogged Files, and the long-form blog is better for longer posts with lots of detail. The Unblogged Files posts take quite a bit of time to put together, so I'm hopeful that I'll be able to spend this extra time crafting more of those longer posts, editing my photos, and so on. I think that six years of consistent posting with a segment is pretty good going! 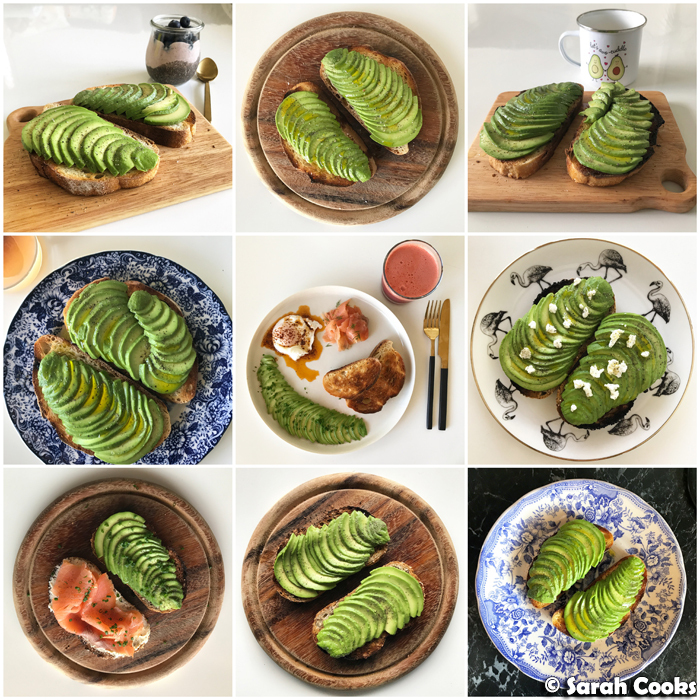 To farewell The Unblogged Files, I'll leave you with one of my avocado montages, and say thank-you to all of you who read along and sent me messages and comments! There wasn't much big travel in 2017 - we'd used up all our annual leave on numerous trips to visit family in Germany over the previous years, so this year's travel was all about mini breaks and snatching time on long weekends. 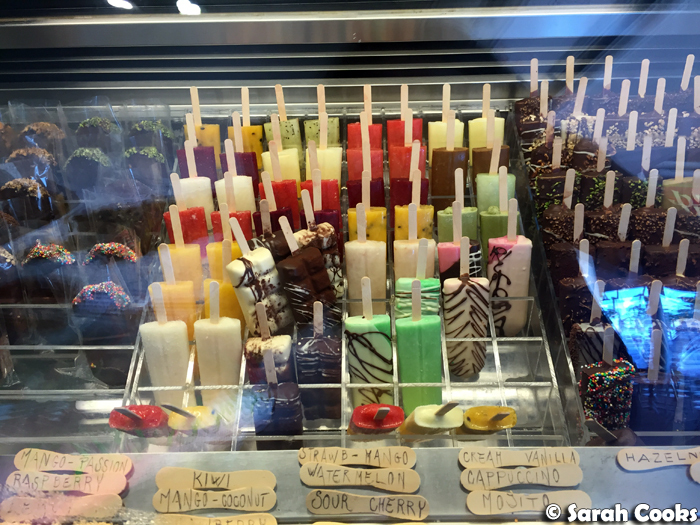 I started the year finishing my posts on our September 2016 trip to Cairns ("Sightseeing and Activities" & "Food"). 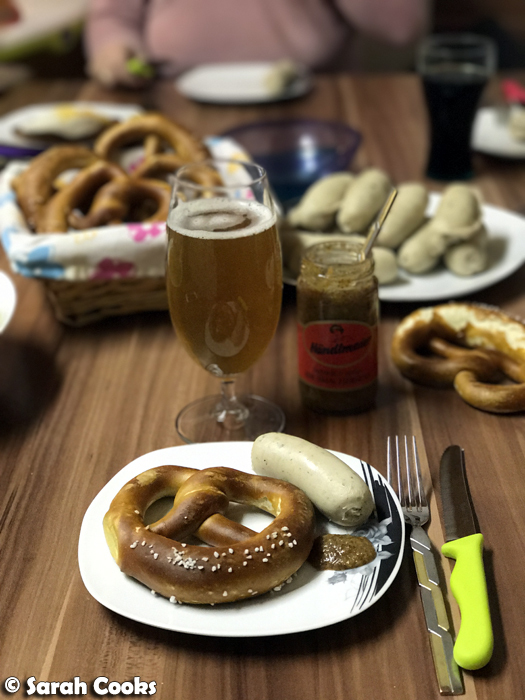 I then moved on to writing about our Christmas 2016 trip to Germany ("Christmas in Germany"), which of course included the obligatory side-trip to Paris! 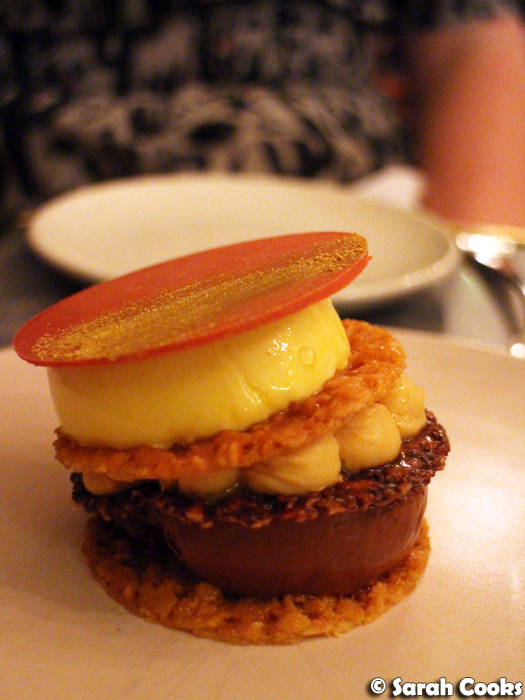 (See: "A Wintry Weekend in Paris", "Sweet Treats from Paris", and "Bistro Paul Bert"). On the way back from Germany, we did 2 Nights in Singapore, and it was great to revisit after 11 years away! 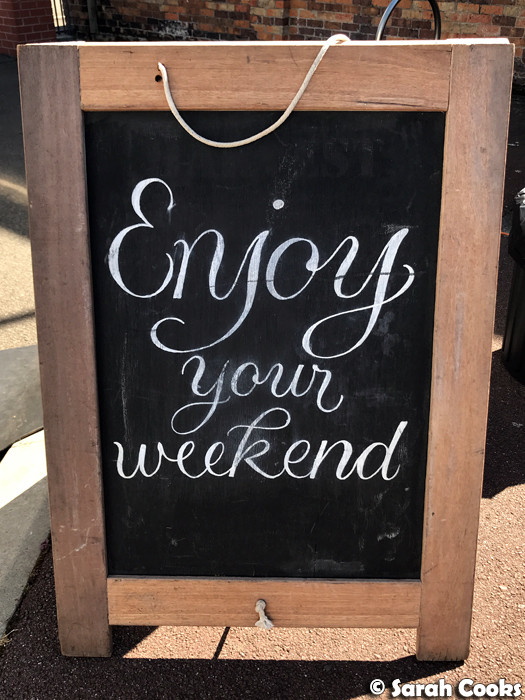 Closer to home, there was A Weekend in Castlemaine, plus an uber-luxurious weekend at Spicers Sangoma Retreat. I've also got weekends in Launceston and Uluru to write up soon! Restaurants! Only five restaurant posts this year, and that's mainly because I visited fewer restaurants than previous years. (Certainly fewer fancy restaurants). 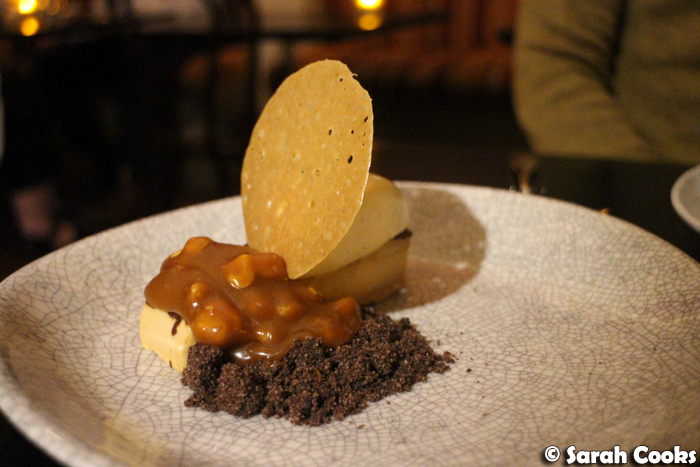 However, the restaurants I did blog are ones that I thoroughly enjoyed! 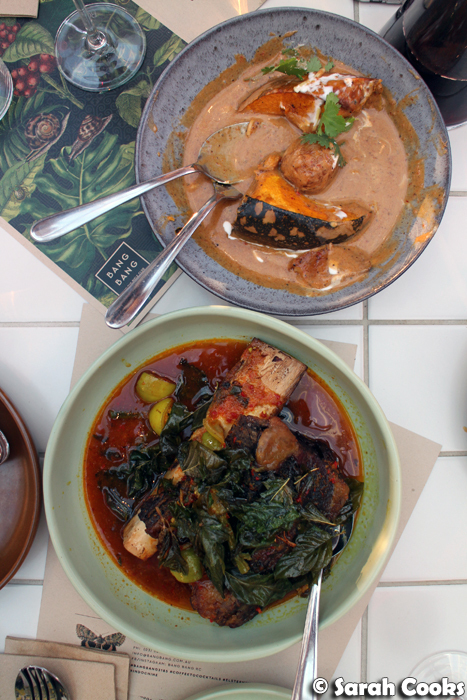 I blogged two invited dinners in full - there was all the meats (and those swoon-worthy buttermilk biscuits) at Fancy Hanks BBQ, and punchy south east asian flavours in a chillaxed setting at Bang Bang at the Rifle Club. 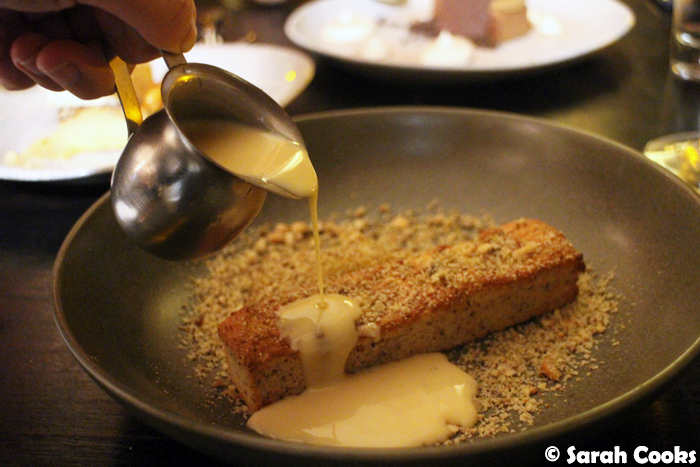 My first post of the year was about one of my favourite, most often visited restaurants: Harley House. And I pulled out the old "featured dish" format for the ridiculously delicious Chicken & Waffles, Belle's Hot Chicken. I can't get over how good the waffles are! A new favourite is Syracuse. I have to admit, I was totally out of the loop and didn't realise that Philippa Sibley had been heading up this restaurant for a year. Whoops. It's excellent, highly recommend. Save room for dessert, obviously. 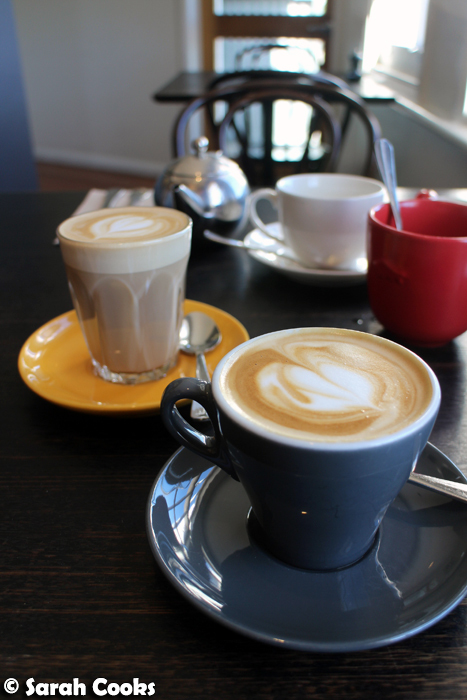 I blogged a few different cafes last year. 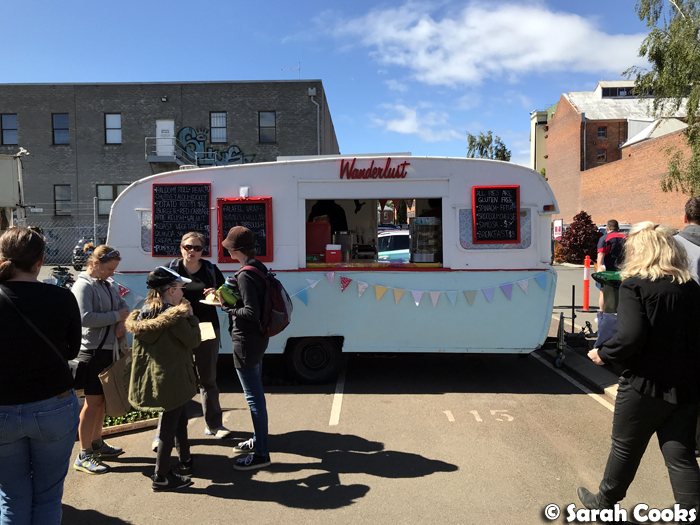 There was the properly Austrian coffee house, Das Kaffeehaus, in Castlemaine; family friendly Third Chapter, in Eltham; and the launch of LuxBite's Viennoiserie range. 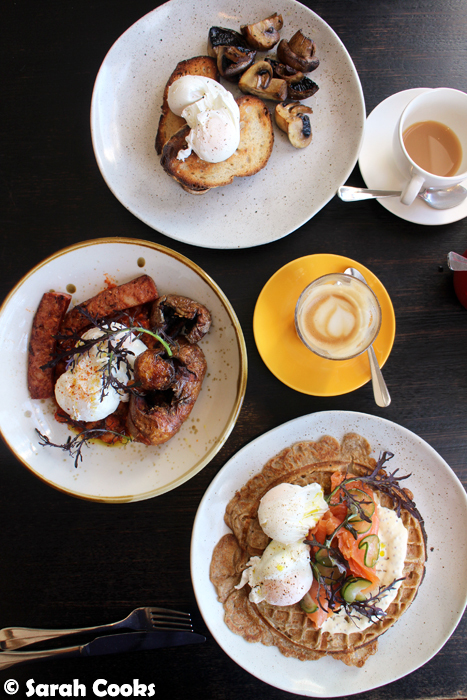 I also did a big round up post of nine different cafes in my Melbourne Brunching post. I've been brunching quite a bit lately, so look forward to some more brunch posts as the year progresses! The next couple of posts don't fit into any particular categories but I was very keen to write about both of them! 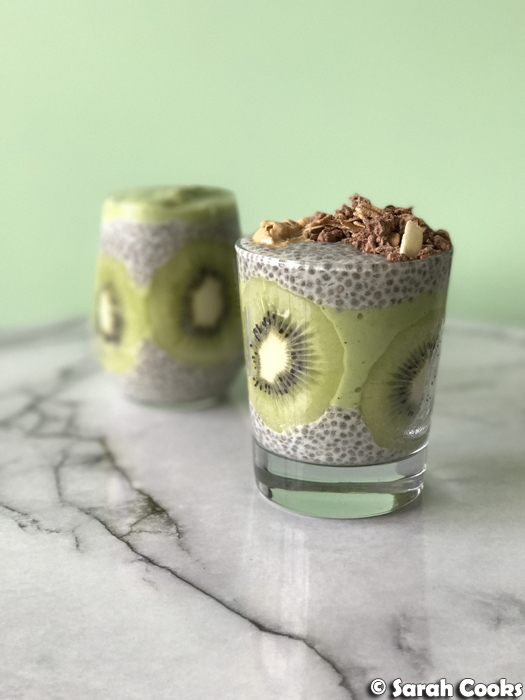 I got a copy of Green Kitchen Smoothies, and made so many of their fab smoothie and breakfast recipes that I had to share with you. Total breakfast inspiration! (This also reminds me I need to blog all the things I've cooked from Nigella's latest, At My Table). 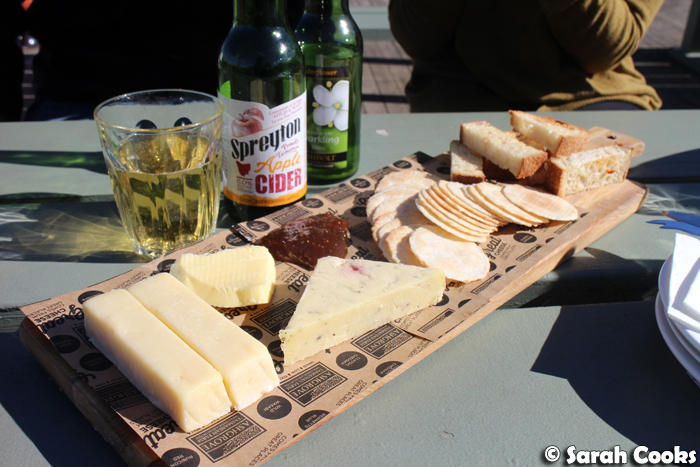 Another great experience was A Day at CherryHill Orchard with a group of lovely food bloggers as guests of the Victorian Cherry Association to launch the cherry season. 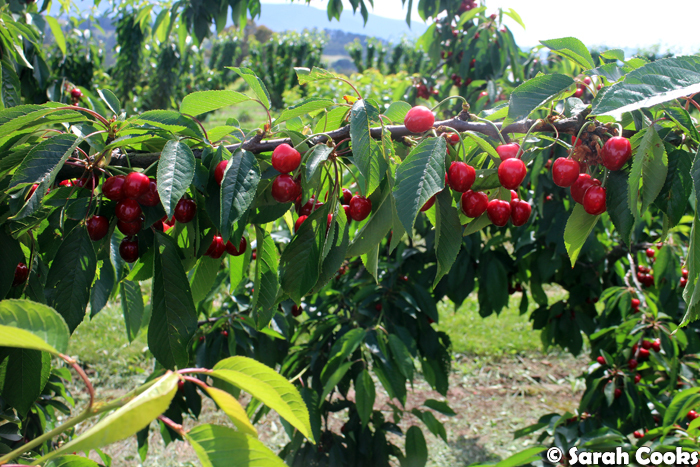 There was cherry picking, cherry drinks, cherry ice-cream and more! (And of course I busted out my cherry dress, woohoo). I did 32 recipe posts this year, representing 45% of total blogposts this year, higher than my usual ratio of 33%, and certainly higher than last year's 24%. (I love numbers). 19 of those were Meal Prep Monday recipes, and the remainder were regular ol' recipes. 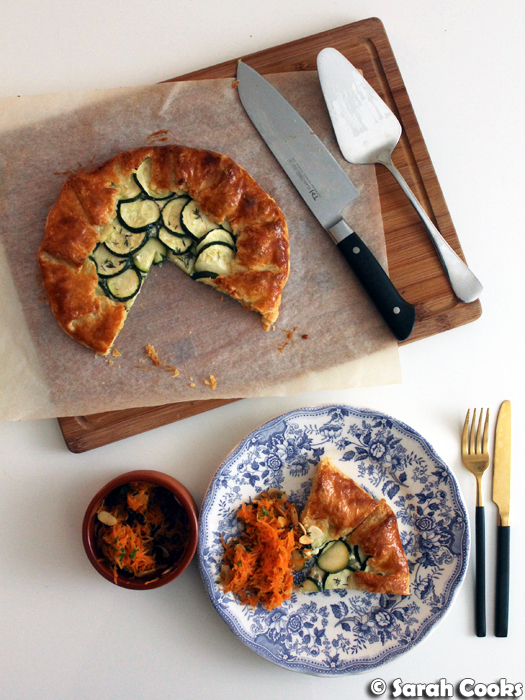 Only three savoury recipes, but all three are winners in my opinion: Käsespätzle, Zucchini and Four-Cheese Galette and How to Roast a Duck (much easier you'd think). Looking back, I'm super excited about the four breakfasts recipes I did: Peanut Butter Granola, Cornflake-Crusted French Toast, Banana Cottage Cheese Oat Pancakes, and Cottage Cheese and Oat Protein Pancakes. 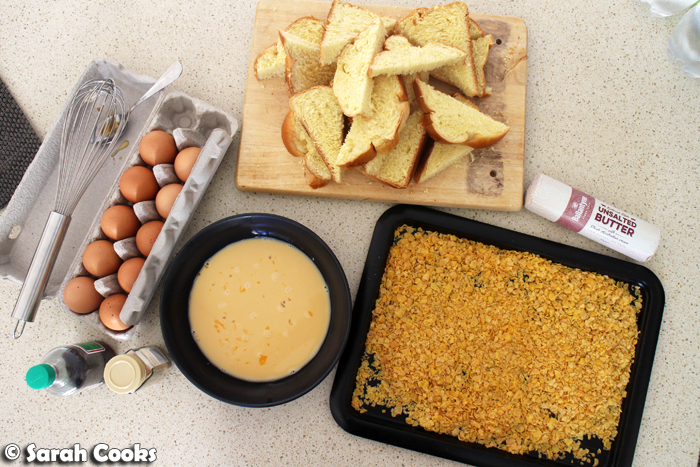 All four of these recipes have become firm favourites. I've lost count of the number of times I've made the PB granola and the cottage cheese and oat protein pancakes! (If it weren't so decadent, I'd be eating that cornflake-crusted French toast ALL THE TIME). There were a few desserts too. 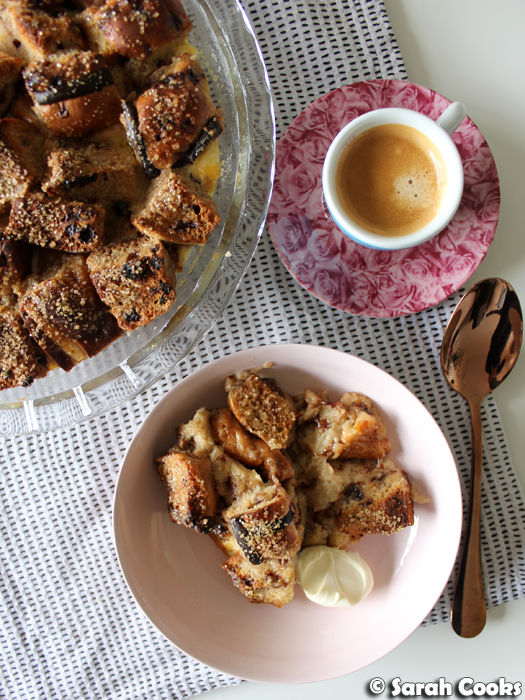 A decadent Hot Cross Bun Pudding, made with the leftover hot cross buns I got at a Baker's Delight Easter Baking Masterclass. For my birthday, I channeled Beatrix with a Cocoa Sour Cream Cake with Chocolate Cheesecake Icing and Raspberry Whipped Cream. (The raspberry whipped cream is SO stable and don't you forget it!) Blueberry Walnut Streusel Coffee Cake makes a gorgeous generous slab of cake, perfect for afternoon tea or a treat of a breakfast. And Nigella Lawson's Cherry Pie is an old favourite that I make all the time. I got really excited about making gym snacks this year (i.e. small, wholesome treats to eat before a gym session to prevent me from fainting), and had grand plans to try a whole bunch of different ones and make it a regular thing on my blog. However, I only ended up doing two: Salted Peanut Rice Krispie Treats, and Peanut Butter Cookie Dough Protein Balls. 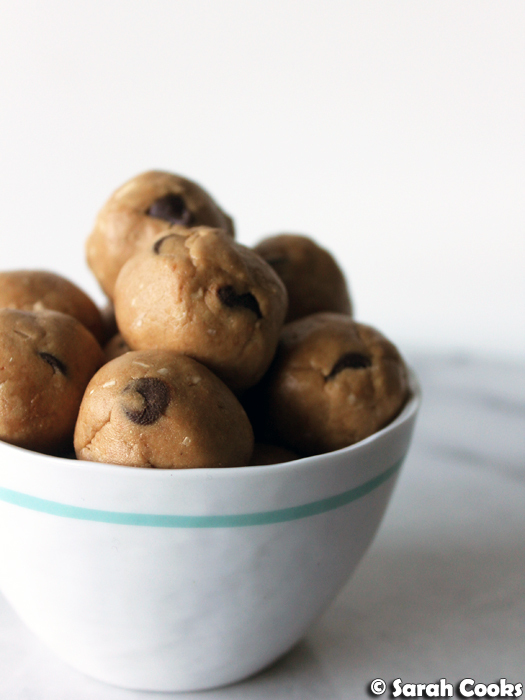 Seriously, once I tasted those peanut butter cookie dough protein balls, I knew I'd never need another gym snack. They are perfection! I have pretty much always got a batch of those on the go in the fridge. Finally, I also did a few posts on celebrations and entertaining. Chinese New Year is always a highlight of the year, as are my birthday celebrations. (See: "Happy Birthday to Me!"). 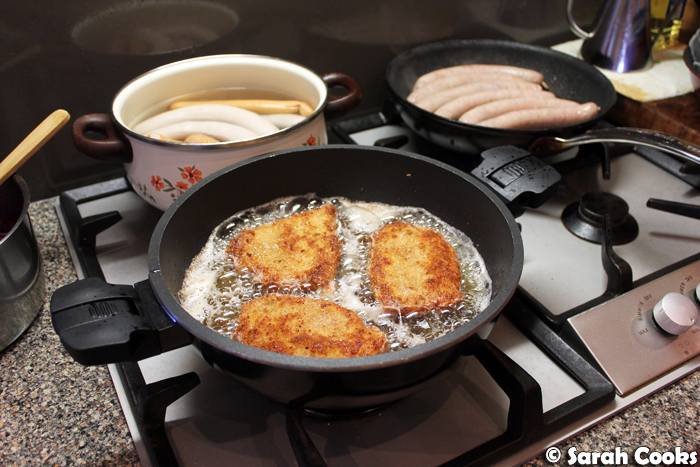 We also hosted Sausagefest!, a big German dinner party to thank our friends who helped us move our fridge. And of course there was Christmas! We did a little ham dinner for Christmas Eve, as well as the whole turkey shebang for Christmas Dinner. Yay! And that was 2017 in the world of Sarah Cooks! I can't quite believe it's been THIRTEEN years since I started my blog in this little corner of the Internet. Thanks to everyone who has been reading along, sending me emails and comments, and following me on Facebook, Twitter, and Instagram. All the best for an amazing 2018!